Along with Terry Pratchett's Discworld series, my fiance has been rather forcefully recommending that I get around to reading Jim Butcher's Dresden Files series. 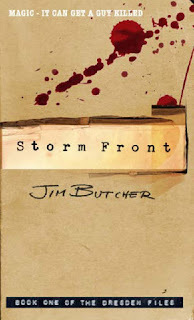 Fond as I am of him and willing as I would have been to take a look because of that, I had already been intending to read the Dresden Files as I had tried and failed to read Storm Front at least three times before I got to it this time. Nothing was going to stop me this time. 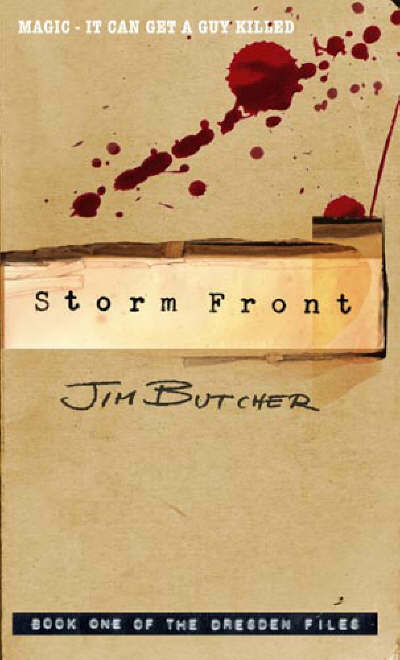 The main protagonist of Storm Front, Harry Dresden, is something of an oddity in his home city of Chicago. He is an openly practicing wizard, even going so far as to advertise his services in the local phone directories. While most of the people who call his office do so to find out if he's serious or not, he does indeed have some magical skill. So when he is called in by the police to consult on a grisly double murder, it means that something is profoundly unnatural about the whole situation. Having started investigating the crime, he finds that whoever is behind the crime doesn't want him to get any further, and they won't pull any punches in trying to impede his search. I honestly have no idea why I couldn't previously finish Storm Front. There wasn't a single thing about this book that I disliked. First, the main protagonist. Harry seems quite the likeable main lead, with an unusually grim backstory that we have only so far gotten hints of. He's very much an old fashioned gentleman type of character, willing to let his adversaries play fair before going in seriously, which is nice if occasionally frustrating. There are a few side characters introduced that I could see being quite important later on in the series, Karrin Murphy, Gentleman Johnny Marcone and Susan Rodriguez in particular, but because of the way that the plot proceeds it does become something of a one-man show. As such, I suppose it's a good thing that his character is so strongly written. Admittedly, I will say that his bad luck with women seems to be a bit arbitrary considering that from what the reader is shown, there isn't really anything that strikes me as obviously repelling about his personality. As such the vaguely romantic stuff does seem a bit out of place and not as confident really. I hope that he stays single for the rest of the series, because romance does not at the moment appear to be Butcher's forte. As for the plot, it's a pretty solid crime story with a fantasy twist. While I wish that I could have learnt a bit more about where the magic in this universe stems from, so that I could get a better picture of what is and isn't possible for one wizard to achieve, I thought that what was included was pretty solid. Mostly it was stuff fairly familiar from European ideas of magic throughout history, things like the power of true names and casting spells using a person's hair or blood, but then the whole thing seemed to come together well enough that there wasn't much that needed reinventing. In particular I liked the potion-making scene, where the ingredients are more vehicles for symbols of what the potion should do than a specific recipe. I thought that was a nice touch. Additionally, I liked the hints of things that have yet to become important in the series. I'm told that some of these things get extra explanation and context, so I'll be looking forward to that.